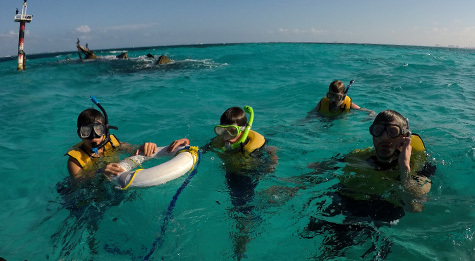 What: Exclusive Snorkeling for non-swimmers in Cancun visiting 4 areas. Where: Door to door transportation is included from Cancun Hotel Zone or downtown. 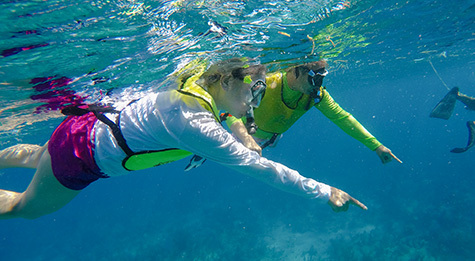 Why: There's no need to swim to enjoy snorkeling, and we're here to share our expertise with you! 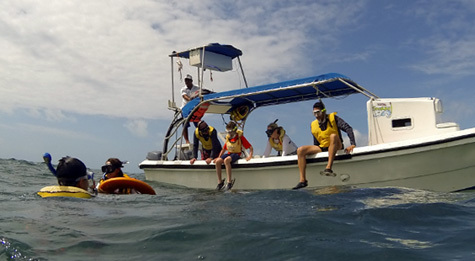 Swim with marine turtles, tons of colourful fishes, coral reef, and an amazing shipwreck even if you can't swim or if you have no previous experience! 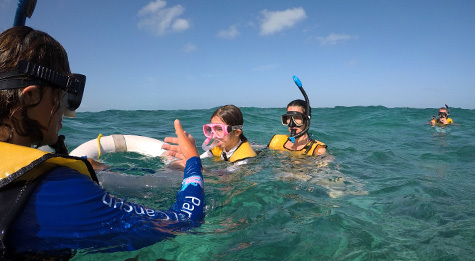 In Total Snorkel Cancun, we're experts turning your anxiety into joy, and we believe that being a non-swimmer or a beginner snorkeling is not a reason to lose the chance to enjoy one of the best activities to do in Cancun. We offer a useful briefing/lesson before getting on board. 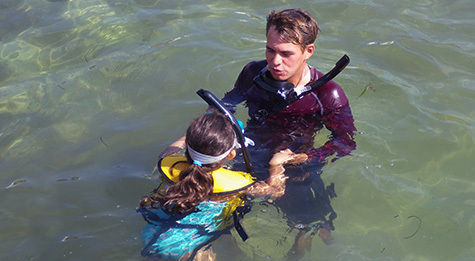 People with few or no snorkeling experience receive the lesson on shallow waters, where they feel safe and open to listening to any instruction. You'll try the gear before getting offshore. We won't leave until you feel 100% comfortable with what you're wearing. The groups are kept small to guarantee personal attention (average 6 people per group). 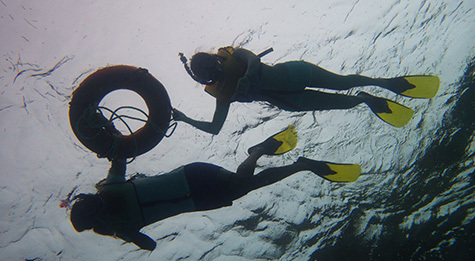 Our guides always wear a wheel (life preserver) where non-swimmers and beginners can hang at any time. There's nothing more important for a non-swimmer than feeling safe, and with someone close who they can trust. The whole area (where the snorkeling tour is enjoyed) has a max depth of 9 feet, and calm waters, with few or no currents. Our brand new "full face" snorkeling masks are ideal for non-swimmers since they don't require to breath through the traditional snorkel. No more water sipping! How to keep calm while using a mask in less than 5 minutes, even if you've swim or snorkel before. Why you don't need swimming skills to enjoy snorkeling after all. The surprising easy tip to defog your mask which you can put to use immediately. 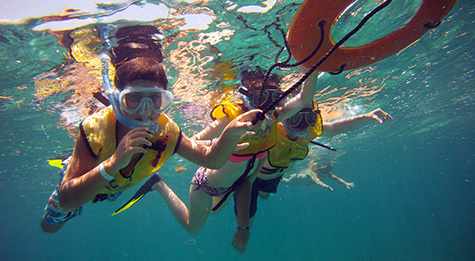 When and how you should use a snorkeling mask instead of just looking over the water. What the experienced swimmers don’t even know about using fins efficiently. Visit a lively coral reef, full of sea life. Swim with hundreds of colorful fish, starfish, and rays! Explore 2 art galleries of Cancun underwater museum (MUSA). Enjoy the astonishing underwater statues. Swim with sea turtles on their natural habitat. 98% of the time we manage to find from 1-5 turtles! Finish the adventure on a shipwreck surrounded by white sand, making a natural pool of calm waters in the middle of the sea. Round trip transportation from any hotel in Cancun (Hotel Zone or Downtown) on a comfortable air-conditioned van. Short and useful briefing-lesson: Before getting on board, non-swimmers and beginners are invited to take a short but useful lesson on shallow waters, that will make your experience much more enjoyable. 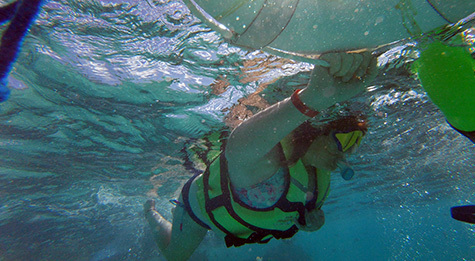 Complete snorkeling gear: Special snorkeling life vest, mask, snorkel, and fins. Qualified and friendly english speaking guides. 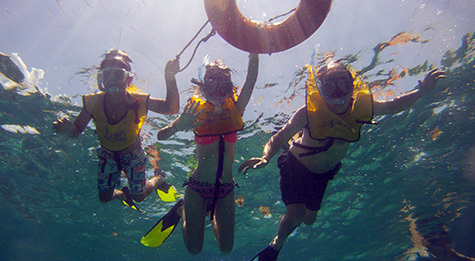 4 snorkeling spots (swim with turtles, reef, Underwater Museum, and shipwreck). Bottled water, shower, towels and lockers. Available daily at 07:00 and 17:00. You will still have time to enjoy your vacations, and have other fun activities during the day. The pick up time is set according to the distance to your hotel. The exact time is sent to you on the booking confirmation. Restrictions: Only children older than 6 years (accompanied by an adult). A responsive letter must be signed, in the case of children their parents must sign.